Here comes first major enemy of Shaktiman, who have some special powers, giving him ability to fought with Shaktimaan (well, up to a certain extent at least). This episode is inspired by many English Movies no doubt, but its content is given Indian makeover. So people (well, the major target audience for this serial is of course from India), can relate with it easily. And we saw an episode with a person having some electrical power in Hindi TV Serial – Arjun – recently. Before a few year, Indian silver screen had seen a movie named – Alag – having a person with similar power as protagonist. So, the concept to having ability to control the electricity or electrical power is kind of evergreen. We see that after publishing exclusive news about the new SuperHero wandering into the city who saves innocent people, fights for the truth and good stuff, Mr. SatyaPrakash Nirala, editor of the newspaper became a kind of celebrity overnight. On one hand people keeps calling his office to get the factual and latest information about this new superhero, and on the other hand even government agencies like CBI are also interested in getting more information about this superhero. A couple of things to note are, the name Shaktimaan is given to the alter ego of Gangadhar, by Geeta Vishwas. Also, the newspaper office had the slogan – Satyamev Jayate – Truth Only Triumphs. Geeta was definitely very happy (Kitu looks natural and convincing here) and enjoying the attention and response her story is receiving from the people. Satyaprakash Nirala was behaving like he was tired of receiving phone calls asking for more and more information (and confirmation of the information published) about Shaktimaan. He was very happy thought. As it was the first time his news paper got so much attention from people, and was able to publish a breaking news! The actor playing Nirala is not very convincing here. Suddenly, the power was gone. Nirala spoke that this power outage is almost a routine nowadays. His assistant confirms that they took an interview of some official of electricity department, and they are also wondering about the same stuff. As it not scheduled outage due to load-shading or any repairing or maintenance work! Geeta sense something wrong in this series of incidents and she expose her doubt to Nirala also. She asks Nirala to let her investigate and find out the truth behind this mishap. We see that the assistant and secretary of the Mayor are involved in some wrong stuff. They meet a doctor who is working on some research work to prepare something for mass killing. And we got to know that he found a way to do the same! He was able to prepare an electric man from using the dead bodies and processing it with high electricity powers. And we got to know that the long power outage in the city, on the regular bases are due to these experiments! The work of the doctor is almost done and now he is planting a lot of power into the electric man so finally he can use it to wreak havoc in the city. Will Geeta be able to find out the truth? 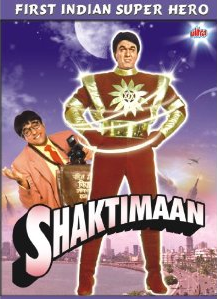 Will shaktimaan got information about electric man? Will he be able to save the city before major damage is done? As electricity is also a form of energy and Shaktimaan is also full of energy, does this clash between different types of energy result into any damage to Shaktimaan himself? Well the answers are almost predictable, right? But it is joy to watch them on screen. If to talk about the screenplay, the writer is able to Indianize the electric man stuff. The action movie lovers who especially see English films regularly may get the feeling of Deja-Vu. And as now a days due to the availability of so many international channels, we are used to watching similar films. So the stuff may not look much interesting. It is however good for the kids (and even elders) to watch the stuff in the flavor of their own culture. Which is the USP of the serial. Also, the power of meditation, yoga and mental strength is explored pretty well. Which inspires one to do such stuff in order to be stronger from within also. And yes, this stuff also inspires you to be good, ethical and better human. If to talk about acting Kitu Gidwani and Mukesh Khanna are the most convincing. Some of the other cast members tried well but some fails doing so. The background music is a positive attribute. Special effects and other technical stuff looks a little below the mark, especially with the technology available now a days. So overall an episode which have moderate content to offer, and you got deja-vu feelings about the stuff. It is appealing though due to the message it tries to send. And, it is definitely much much better option then some super-hero flicks which rather have absurd events and situations planted with some abusive material.